Follow these security guidelines to install custom apps created for your organisation. Organisations can use the Apple Developer Enterprise Program to create proprietary enterprise apps for iOS devices and to distribute them to employees for internal use. Before one of these apps can be opened, it must be trusted. Trust has established automatically if the app is installed by Mobile Device Management (MDM). If you install an app manually you must also manually establish trust as described below. 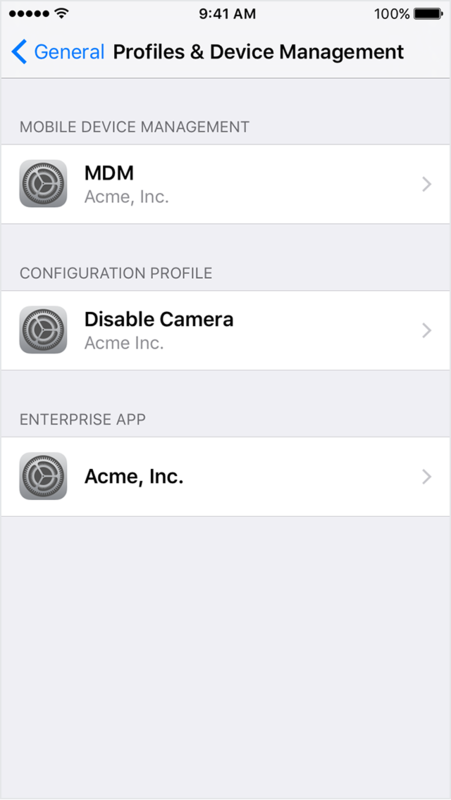 Apple recommends using an (MDM) solution to distribute the apps because it is secure and requires no user interaction. Users can also install these custom apps from a secure website operated by their organisation. If you're not installing an app from your organisation, the best way to protect your iPhone, iPad, or iPod touch is to download and install apps only from the Apple App Store. 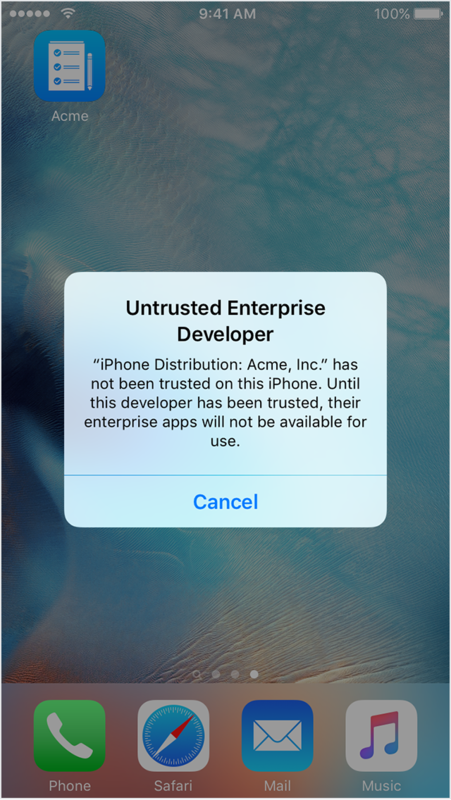 When you first open an enterprise app you've manually installed, you see a notification that the developer of the app isn't trusted on your device. You can dismiss this message but you can't open the app. After dismissing this message you can establish trust for this app developer. Tap Settings > General > Profiles or Profiles & Device Management. You then see a profile for the developer under the "Enterprise App" heading. You're then prompted to confirm your choice. Once you trust this profile, you can manually install other apps from the same developer and open them immediately. This developer remains trusted until you use the Delete App button to remove all apps from the developer. 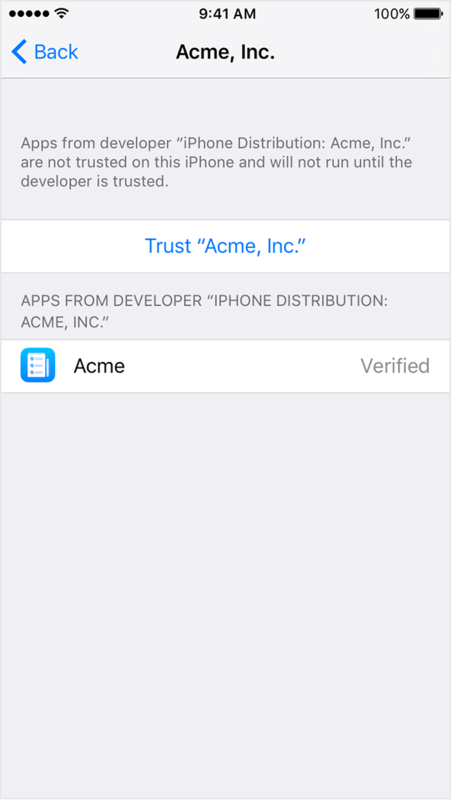 An Internet connection is required to verify the app developer's certificate when establishing trust. 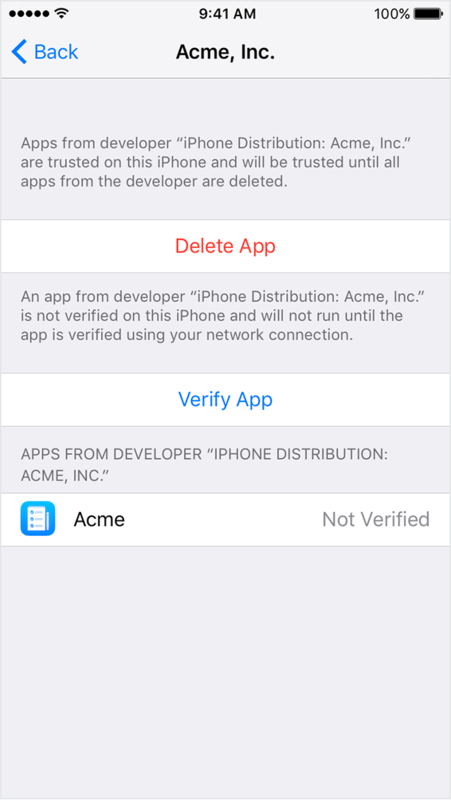 If you're behind a firewall, make sure it's configured to allow connections to Apple PPQ If you aren't connected to the Internet when you trust an app, the device displays "Not Verified" instead. In order to use the app, you need to connect to the Internet and tap the Verify App button.